IF YOU ALREADY OWN A ZOOM Q3 YOU MAY STILL PURCHASE SOME OF ITS ACCESSORIES FROM OUR Q3 WEBSHOP BELOW. As our name suggests, here at Solid State Sound we specialise in solid state digital audio recorders. We normally leave video kit alone and so we were reluctant at first to offer the Zoom Q3. But there's no getting away from the fact that, in this day and age, something as inexpensive and clever as the Q3 is just perfect for easily capturing important sound AND video for quickly uploading to YouTube, Facebook and other sharing sites. So we relented and here it is! 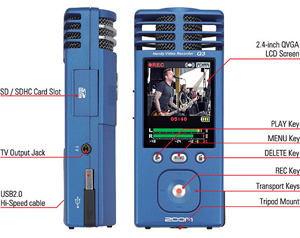 The Q3 uses the same microphone capsules as Zoom's popular H4n Handy Recorder and is perfect for recording anything where great audio-with-video are a must. From live musical performances and rehearsals, interviews, conferences to video podcasts, journalism, education, recitals, weddings or sports, the Q3's pristine audio quality takes your videos to another level. • Get Started Right Away! Designed with everything you need to make your movies right out of the box, the Q3 includes HandyShare software for editing, and a 2GB SD card for up to 1 hour* of video recording time. 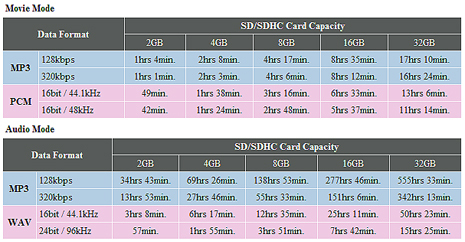 And the Q3 will also accept up to 32GB SDHC cards for a staggering 16 hours* of moviemaking! 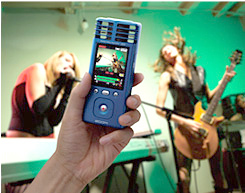 *Video shooting time is based on an audio quality setting of MP3 at 320kbps. Recording times are approximate. 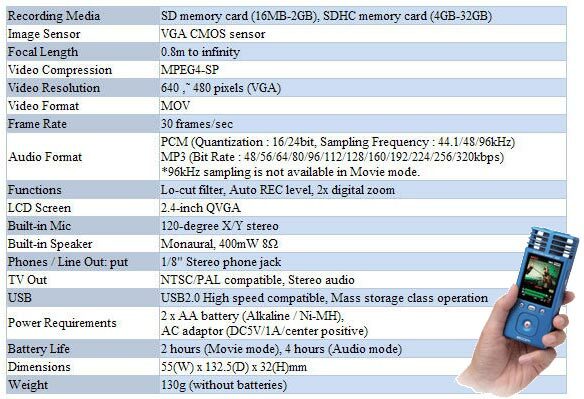 In Movie Mode the maximum file size is 4Gb and in Audio Mode the maximum file size is 2Gb. The Q3 supports QuickTime (MOV) format. With MPEG-4 SP compression in VGA size (640 x 480 pixel) at 30 frames per second, you can record very smooth video shots anywhere, anytime. Plus, integrated digital 2 times zoom function enables you to get up close and personal. When your shoot is complete, the Q3's cleverly designed pop-out USB cable lets you upload your movies to your computer. Then use HandyShare to edit and share them on your favourite websites including YouTube, Facebook and MySpace. Or, plug in the included TV cable and watch your videos on television. 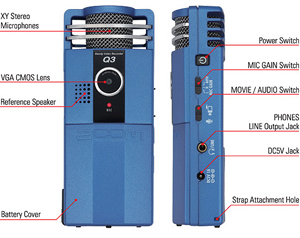 The Q3 has two condenser mics on-board, engineered in the same X/Y pattern as the H4n Handy Recorder that gives recording pros the best stereo recording possible. Arranged with the right and left mics on the same axis, this design ensures that the mics are always an equal distance from the sound source for perfect localization without phase shifting. The result is a great sounding recording with natural depth and highly accurate stereo imaging every time... all at the touch of a button. The Q3's X/Y microphones are directional, so you can "focus" the mics on your sound source. Use the on-board audio meters to set the gain to Low, High or Auto so you can record in very loud or very soft environments. Or use the Q3's Auto Record Level function to automatically set the appropriate recording levels for the situation! Shoot your video with the confidence that the Q3 is capturing great audio at the absolute best level possible. With the Q3, all your videos will sound almost like they were recorded in a professional studio. Ideal for shooting any kind of musical performance from jazz to classical to metal, solo to orchestral, the Q3 will make it fun and easy to shoot your music videos anywhere, anytime. The Q3 also makes it easy to share your videos on YouTube. Simply plug the Q3 into your computer, launch the onboard HandyShare software and select the videos you want to put on the web. And if your video needs a few edits, you can use HandyShare to cut your movie before you share it with the world. The Q3 makes an useful accessory for 'quickie' videography. Imagine being able to use the Q3 for individualized video shoots of the bride and groom before a wedding. Or give a Q3 to wedding guests for personalized video clips. Capture the wedding music with ease. The possibilities are truly endless. And with pristine, focused audio, you'll never miss a moment, even in a noisy environment. With an on-board low-cut filter to reduce background noise and an included windscreen, you can make movies with incredible audio clarity, even outdoors. To play music better, seeing is almost as important as hearing yourself. With the Q3, you get both capabilities. Teachers and students alike will find lots of uses for the Q3 from the classroom to the practice room. Ideal for recording auditions or making video lessons available to students, the Q3's amazing stereo recording will capture every nuance while the video rolls. Use the Q3 on a microphone stand with optional mic clip adaptor. For added convenience, the Q3 includes two standard AA/LR6 batteries that give you about two hours of battery life with continuous video recording. Or use two AA-sized Ni-MH rechargeable batteries with dedicated charger (see our options below), or an AC adaptor (option AD-14 sold separately).